I have a confession: I'm left-handed. Well, sort of. I eat left-handed and I write left-handed. However, I punch, bat, bowl, throw, etc. right handed. I ended up specializing my left hand for fine motor skills and my right hand for gross motor skills - I am by no means ambidextrous. This was not a conscious decision, but it turned out well for me. (Note: Wikipedia informs me that this is called mixed-handedness or cross-dominance - I never knew there was a name before, but I'm happy to keep company with that list of people!) In any case, I certainly identify myself as a left-hander since most things that are left/right specific end up requiring fine motor skills. Included in this list is the Nintendo DS. I would really like to understand how freaking difficult it is to enable your game to be left handed. In some cases perhaps it's non trivial if you have to move your entire UI around, but the ones I'm talking about are generally simple button-remapping. And this isn't a trivial part of your audience. Wikipedia states (yes, I cited Wikipedia - deal with it) that a British study in the 70s found that 11% of people aged 15 - 24 are left-handed, and a separate study in the US found 12% of 20 year olds to be left-handed. So, that's a core age demographic for you, and at 11% of all of your gamers you'd think it'd be worth noting the fact that your game is nearly unplayable for left-handers. Hell, how do you not have at least one left-handed on your dev team? It's unbelievable. Yet we end up with games like Final Fantasy XII: Revenant Wings that map all scrolling to the left D-pad and a few low-priority buttons on the right hand. So, anyone using their left hand for the stylus is stuck trying to also control the camera with that same hand. 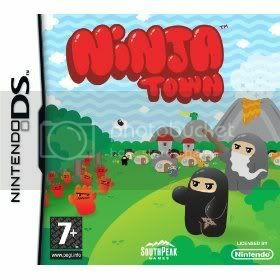 And it gets even worse with Ninja Town. You know what the 4 buttons do on the right side? NOTHING! Not one damned thing. They're dead buttons. How hard would it have been to map them to the same movement as the D-pad? The answer is it would have taken the programmer about 30 seconds. If he were a slow typist. I can't really think of a bigger "Screw you!" to left-handers than just killing the buttons that are so easily accessible to them. And yet I purchased this game, only perpetuating the idea that it's okay to give lefties the finger if you're a game developer. And yeah, sure, in the grand scheme of life left-handed oppression is really not all that important or even really oppressive. The original study that showed a 9 year decrease in life expectancy for left-handers has been debunked repeatedly. But these are people whose job is to make a fun, enjoyable game that people will buy, and yet they can't seem to get basic interface principles down. It truly boggles the mind.